About six or seven years ago, when I first began visiting London regularly, I made it a priority to eat at St. John’s, Fergus Henderson’s restaurant in the Clerkenwell area. The experience exceeded my expectations. I had a server who was very attentive and concerned to make my meal memorable. Henderson’s marrow bones and toast utterly wowed me. Unfortunately, I’ve never been back. But after eating a gorgeous roasted pork belly with a tomato-cucumber salad at Lillette in New Orleans last spring, I decided I’d try making it myself. Chowhounds.com has an entry with images of a pork belly prepared by other enthusiasts. That blog alerted me not just to Henderson’s recipe, but, even better, to his cookbook. I was delighted to learn that it’s in an expensive paperback edition. So, here is his version and then the changes I made to it. Bring all the brine ingredients together in a pot, and bring to a boil so the sugar and salt melt. Decant into a container and allow to cool. When cold add your meat, and leave it in the brine in the refrigerator for the number of days required for your recipe. Bring your pork belly for 3 days, rinse, then score the rind gently with a sharp knife (a retractable blade knife is excellent for this purpose). Place the onions on the bottom of a roasting pan (their purpose is, as well as flavor, to stop the belly sticking). Lay the belly on top. Rub the rind with a little oil and then the salt. Place in a medium to hot 375 oven for 1 ½ to 2 hours; keep an eye on it so it does not burn. If you’re anxious that the rind is not crisping up, you can start or finish the belly under the broiler. When cooked you should have crispy rind on top of soft and giving fatty flesh. Lift off the onions and serve. What could be easier? That recipe looked like a slam-dunk from start to finish. Actually, I have a few suggestions. I followed the above recipes to the letter. I was very happy with the result in taste and appearance, except that the onions burned to a crisp and stuck to the bottom of my braising pan. But as the recipe indicates, the pork belly didn’t stick, which is something, I suppose. I cooked it nearly a full two hours. I made a salad of tomatoes and cucumbers dressed very lightly with a tart red-wine vinaigrette. Every bite I took of the pork belly was followed immediately with a bite of the salad. The combination sliced through the flavor of the fat. Still, as delicious as I thought it was, I couldn’t eat a lot of it. I especially enjoyed the cracklin’ rind. When I make this again (I’ve got two more squares of it in my freezer), I think I’ll use some chicken broth to braise it instead of roasting it. I wonder how it might work braised on cabbage. Updated, 4/28/08: The hot weather is here. Tonight was my chance or never. If I didn’t braise the frozen slab of pork belly in the freezer tonight it would be lost. I’ve endured nearly 3 hours of a hot house and decided that tonight’s dinner was only a skirmish. The battle for a perfect home-cooked pork belly would resume in the fall. I basically followed the advice that I recount here. After saute-ing shallots and garlic in olive oil, I added an unbrined 5 oz square of pork belly. I poured in a bit of chicken broth and white wine, brought it all to a vigorous simmer and put it uncovered in the oven at 350. Eventually, I turned the temperature down to 325, because the liquid was evaporating too quickly for a 2 hour braise. I kept a small saucepan of chicken stock and wine at a simmer on the stove top. When I thought the liquid was in danger of evaporating completely, I add some more. In the meantime I prepared the tomatoes and cucumbers and whisked a rice wine vinegar and olive oil dressing. Now that I’ve eaten it, I know how to make it better. First of all, I’m going to brine it again next time. Perhaps I won’t do it quite as long as Fergus recommends, but I think it will help soften the skin. And next fall I’m going to braise it on the lowest heat for hours and hours. I think that’s the way to do it. Even at two and a half hours, I wasn’t happy with the degree to which the fat had been rendered. It needs a slow, steady braise that transforms all the white fat to translucent gold. I also put a little of the shallot/garlic oil from the bottom of the pan in a little finger bowl to see how it tasted with it. 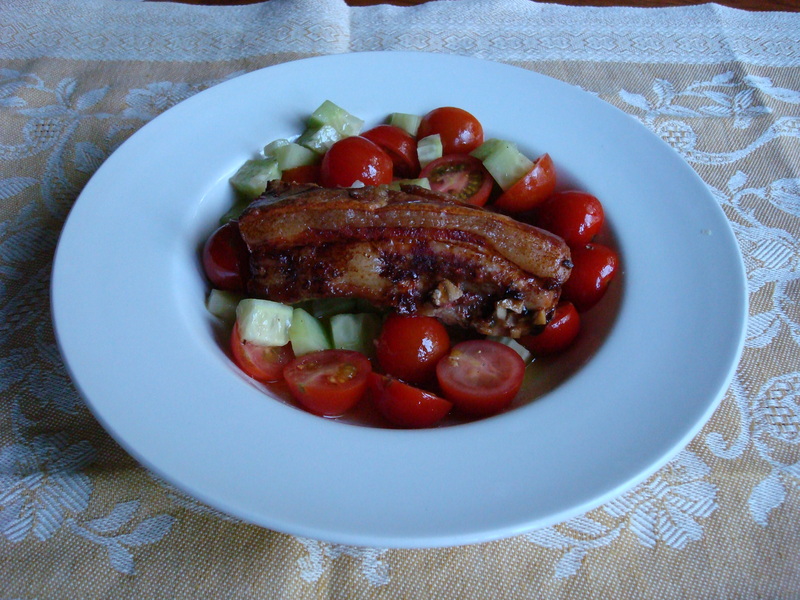 Forget it: the tomato cucumber salad complements pork belly far better than anything you can braise it in. This is a dish that demands contrast to slice through the fat. As for the wine, all I can say is that two sips convinced me that my choice of a southern French rosé with substantial body was NOT the right choice. Next time, I’ll try a Rhône or a pinot noir. An off dry reisling with good acidity goes brilliantly with a dish like pork belly. Oh, excellent suggestions! I’m going to try that next time.